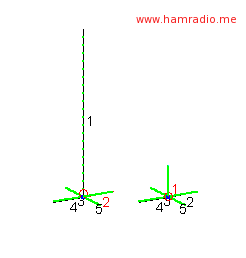 Vertical antennas may have lower angle radiation than dipoles unless the dipoles are very high above the ground. However, vertical antennas rely immensely on ground conductivity well away from the antenna to realize this possible benefit; Go to http://www.cebik.com/ for the reasons why. Trap verticals have been around for decades and many use them with success. However, two new designs have achieved some notice and are attempting to eat into the trap vertical market: The 43 Foot Tuner Required Fixed Length antenna and the Variable Length SteppIR BigIR antenna. During this shootout we will compare a 43 foot antenna with the BigIR one band at a time. The base model for this analysis will use a ground vertical model from Larry Cebik’s NEC model collection which simulates the benefit of a good radial system. The radial lengths will be adjusted for each band and will be identical for both the 43 foot and the BigIR. The 43 foot vertical will, of course, never change height. The BigIR will be “adjusted” in height for minimum SWR at the test frequency. Where the BigIR can be 3/4 wavelengths height that will be calculated too. Note, all the above comparisons have the antennas ground mounted, not elevated. The 43 foot vertical - The answer to everything?